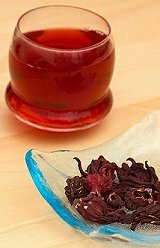 Hibiscus tea made from dried flowers of Roselle (Hibiscus sabdarrifa) is a caffeine-free natural beverage with possesses a great number of therapeutic powers. In the Middle East, it is a very common herbal remedy to calm down minor digestion disorders, as well as the symptoms of common cold and the flu. Roselle is considered an almost all-purpose medicinal plant and its many parts like blossoms, leaves and even roots can be used as effective herbal remedies for various diseases and health conditions. First of all, hibiscus tea is known for its extremely high content of antioxidants (mainly flavonoids), therefore hibiscus tea benefits embrace all the actions that involve antioxidants. Natural flavonoids assist out body in neutralizing negative effects of free radicals, this way slowing down aging processes, protecting us against cancer and improving our general health. Hibiscus tea and infusion are rich in enzymes which slow down chemical processes in our body linked to breaking complex sugars and carbohydrate absorption. Therefore, drinking 1-2 cups of this beverage on a regular basis can stimulate weight loss, and it is one of the most important health benefits of hibiscus tea. Besides, hibiscus tea is known as one of the richest source of Vitamin C, which plays a role for strengthening our immune system. This vitamin helps us to ward off various infections and colds, therefore hibiscus tea benefits include bringing relief from coughs, chest pains, sore throat and other common symptoms of respiratory diseases. Regular consumption of hibiscus tea is linked to lower chances of suffering from constipation and having bladder infections. This herbal remedy can be also used to improve our body’s ability to manage with stresses and stimulate detoxification. Finally, hibiscus tea has numerous positive effects on our cardio-vascular system. It supports the function of the heart and is a great remedy to strengthen blood vessels. Health benefits of hibiscus tea include lowering blood pressure and lowering high levels of cholesterol in the blood. To prepare a good hibiscus tea, take 2 teaspoons of dried hibiscus blossoms, put in a teabag, add 8 ounces of water, boil for 5 minutes and let it rest for 15-20 minutes. This is an awesome tea. I’m using the Flor the Jamaica Tea to lose weight. Love this tea. Been drinking it more and more lately. The flavor is delicious and its super good for your health. Anyone would do well to start drinking it on a daily basis instead of their current sugared drink.